Early Modess ads: newspaper, 1928, 1931,"Modess . . . . because" ads, the French Modess, and the German "Freedom" (Kimberly-Clark) for teens. Early Midol ads for headache, hiccups, and PMS. Kotex was not the first American disposable pad, as the ads below show. Yes, Johnson & Johnson made the throw-away Lister's Towels - pads - in the late 19th century but who would've guessed there were other makers of the pads in the 1910s and 1920s? Not me! 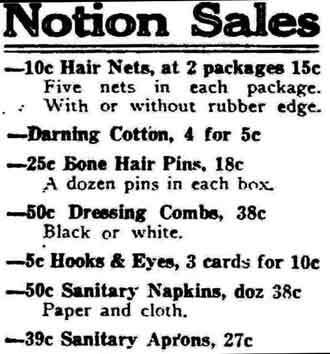 As you can see (and here, too) companies sold washable cloth pads along with paper pads. 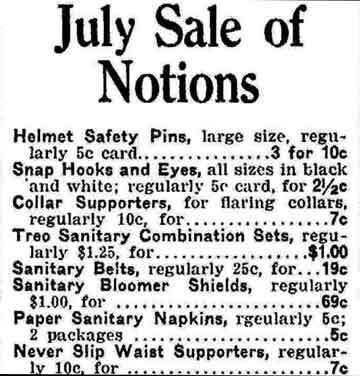 Cloth pads gradually faded during the 1920s in America (but not in Germany!) only to revive in the last quarter or so of the 20th century, partly from ecological concerns, partly from women accepting their periods.. I thank the industrious retired teacher and genealogist for sending these scans and many others! Below: From the Fort Wayne [Indiana] News, July 9, 1917. Paper sanitary napkins, which would be disposable (remember that Kotex appeared in 1920). Note the misspelling of "regularly," easy to do when hands rather than computers set the type and the only spell checkers were people. See some menstrual belts. See a beautiful ad for sanitary bloomers and more ancient and modern underpants. Below: from the Daily Northwestern, Oshkosh, Wisconsin, Sept. 9, 1915. Paper and cloth menstrual pads. 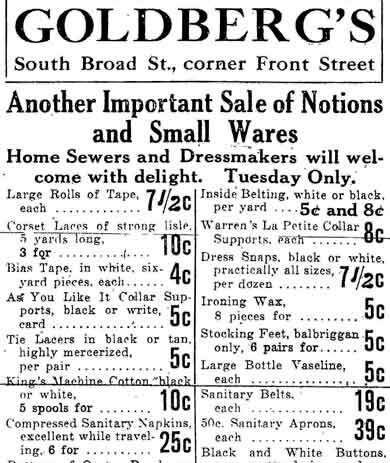 Below: from Newport [Rhode Island] Daily News, April 22, 1914. Below: from the Trenton [New Jersey] Evening Times, June 19, 1916. Possibly the first American disposable pad: Lister's Towels - Early Modess ads: newspaper, 1928, 1931,"Modess . . . . because" ads, the French Modess, and the German "Freedom" (Kimberly-Clark) for teens. Early Midol ads for headache, hiccups, and PMS. Other Modess ads: another from 1928, 1931,"Modess . . . . because" ads, the French Modess, and the German "Freedom" (Kimberly-Clark) for teens.